Converting Lead Into Tea – Battery Pack Alchemy! I’m transforming Junior, my Sprinter van, into an urban stealth camper and mobile office so I can live and work off grid anywhere. Junior has now successfully boiled water with his fully-wired battery pack! 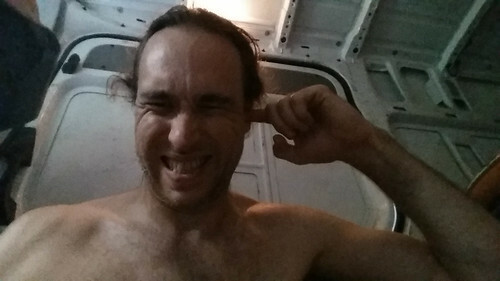 I can now use my tea water heater, coffee maker, computer and monitor, and other 120V appliances inside the van. Now that the batteries are wired, it’s time to test each of those items to see how much power they use. I tried using two of the four batteries first, but the voltage sagged so much it set off the piercing low voltage alarm on my inverter! Ouch! Once I have all that data, I can make a finished wiring diagram I’ll finally be able to order the wire I need to finish the job. RV power systems are way more complicated than 120V home wiring, so every detail has to be known in advance to get it right. 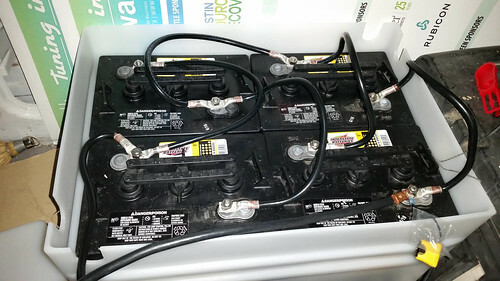 I’m using four Interstate GC2-RD 6V 208 Ah (at 20A) flooded golf cart batteries for my pack. Each pair is in parallel, giving me two 416 aH 6V sub-units. Those two pairs are wired together in serial, giving me a total of 416 Ah at 12V. Deep cycle batteries last a lot longer if they’re only discharged half way, so I have an effective usable capacity of 208 Ah before I have to recharge. I chose these batteries because they provide a lot of punch for a relatively low cost. Flooded batteries have to be vented, topped off, and overcharged periodically, but provide the best balance of cost and performance. Many RV users choose AGM (sealed) batteries instead because they are maintenance-free and don’t have to be vented as much, but they cost nearly twice as much for the same performance. Lithium Ion are the best for all features, but cost more up front and require special hardware. If I really love RV living full time, I’ll look into LiION again when these batteries die in 5 or more years. Because I won’t have enough data to order any of my final, expensive welding cable wires until *after* I test all my appliances, I chose to make a temporary wiring harness for my pack using 2 gauge cable and lugs purchased at Home Depot. This wire is too small for my final result, but is good enough for testing. At this point it looks like I’ll probably be using 00 cable for my battery interconnects and the run from the alternator (which can provide 180A!) to the pack. I’m using this ampacity chart recommended by my friend Chris, who is a professional gas-to-electric car converter and has years of experience in vehicular power applications. It tells me how many amps a given thickness of cable can carry without overheating. 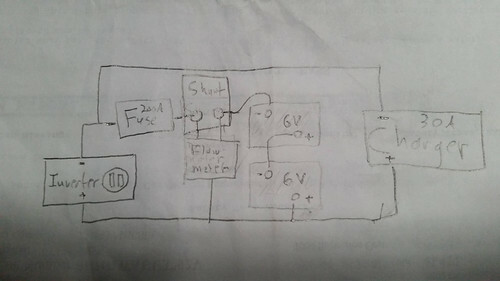 For a final design, I need to know how much power each item either takes out or puts into the batteries and when. I need to know both the maximum power it takes, and how much it takes over time. 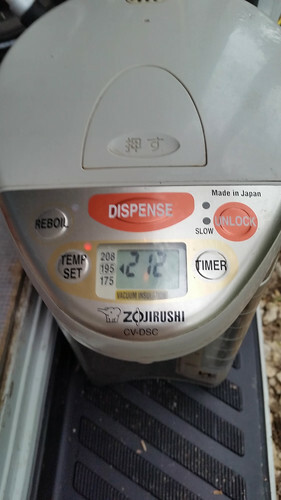 For instance, the Zojirushi water heater pulls 74A when initially heating cold water for about 20 minutes, then pulls about 0.4A afterward to keep it hot. The system has to be able to handle the maximum power draw of all systems I might use at the same time, have enough battery capacity to run them all for a few days if there’s no sunlight, and also be able to keep up with all the things that run all the time like the fridge, the water heater, the fan, etc. To keep track of power flow into and out of the batteries, I’m using a TriMetric TM2030RV meter. To get 120VAC from 12VDC, I’m using a Xantex ProWatt 2000 inverter. For charging I have four 100 watt solar panels and a MPPT charger, a Mercedes-stock alternator relay to charge from the vehicle’s engine, and I just bought a Dewalt 12V 30 amp charger to charge from 120V. I will cover those items next. 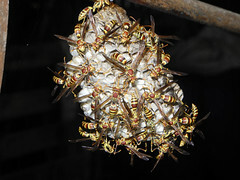 This entry was posted in Uncategorized and tagged amps, battery, bogart engineering, buddhism, camping, car living, collapse, conversion van, dewalt, game development, ger, gypsy, home improvement, home repair, interstate, junior, maker, MetroRV, minimalism, moebius trip, moebiustrip, nomad, nomadism, off grid, paleo, peak oil, permaculture, portland, prep, prepper, prowatt, revolt, rv, rving, sell your crap, simple living, socialism, solar, solar panels, solar power, sprinter, survival, survivalism, sustainability, technomad, the road, tortoise and hare, Travel, trimetric, van living, volts, xantrex. Bookmark the permalink.